542 to 488 million years ago. "The Cambrian period marked a profound change in life on Earth. Before the Cambrian, life was on the whole small and simple. Complex organisms became gradually more common in the millions of years immediately preceding the Cambrian, but it wasn't until this period that mineralised - hence readily fossilised - organisms became common. This diversification of lifeforms was relatively rapid, and is termed the Cambrian explosion. 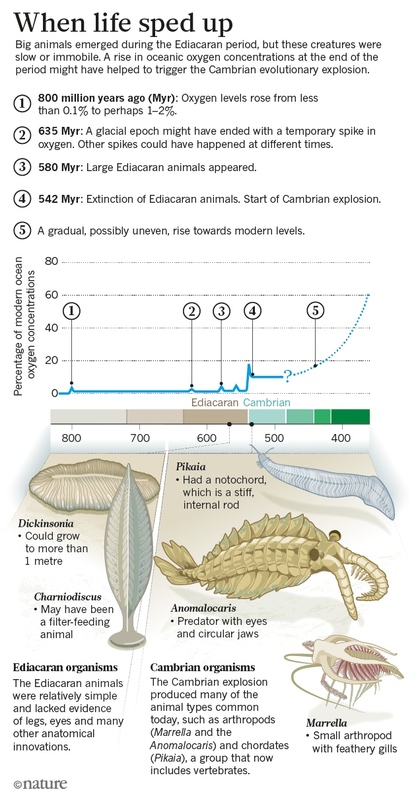 This explosion produced the first representatives of most modern phyla"
"The Cambrian marked a steep change in the diversity and composition of Earth's biosphere. The incumbent Ediacaran biota suffered a mass extinction at the base of the period, which corresponds to an increase in the abundance and complexity of burrowing behaviour. This behaviour had a profound and irreversible effect on the substrate"
"The "Cambrian substrate revolution" or "Agronomic revolution", evidenced in trace fossils, is the diversification of animal burrowing during the early Cambrian period." 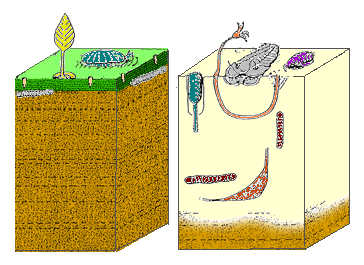 "Before this "widening of the behavioural repertoire", bottom-dwelling animals mainly grazed on the microbial mats that lined the surface, crawling above or burrowing just below them. These microbial mats created a barrier between the water and the sediment underneath, which was less water-logged than modern sea-floors, and almost completely anoxic (lacking in oxygen). As a result the substrate was inhabited by sulfate-reducing bacteria, whose emissions of hydrogen sulfide (H2S) made the substrate toxic to most other organisms. Around the start of the Cambrian, organisms began to burrow vertically, forming a great diversity of different fossilisable burrow forms as they penetrated the sediment for protection or to feed. These burrowing animals broke down the microbial mats, and thus allowed water and oxygen to penetrate a considerable distance below the surface. This restricted the sulfate-reducing bacteria and their hydrogen sulfide emissions to the deeper layers, making the upper layers of the sea-floor habitable for a much wider range of organisms. The upper level of the sea-floor became wetter and softer as it was constantly churned up by burrowers." "Ironically, the first burrowers probably fed on the microbial mats, while burrowing underneath them for protection; this burrowing led to the downfall of the mats they were feeding on." "The rise of burrowing represents such a fundamental change to the ecosystem, that the appearance of the complex burrow Trichophycus pedum is used to mark the base of the Cambrian period." "Before about 580 million years ago, most organisms were simple, composed of individual cells occasionally organized into colonies. Over the following 70 or 80 million years the rate of evolution accelerated by an order of magnitude (as defined in terms of the extinction and origination rate of species) and the diversity of life began to resemble today’s." "Rocks dating from 565 to 543 million years ago contain fossils of the Ediacara biota, organisms so large that they must have been multi-celled, but very unlike any modern organism." "The earliest Cambrian trilobite fossils are about 530 million years old, but the class was already quite diverse and worldwide, suggesting that they had been around for quite some time." "Trilobites first appear in the fossil record during the Early Cambrian period (540 million years ago) and flourished throughout the lower Paleozoic era before beginning a drawn-out decline to extinction when, during the Devonian, all trilobite orders, with the sole exception of Proetida, died out. Trilobites finally disappeared in the mass extinction at the end of the Permian about 250 million years ago." "When trilobites first appear in the fossil record they were already highly diverse and geographically dispersed. Because trilobites had wide diversity and an easily fossilized exoskeleton an extensive fossil record was left, with some 17,000 known species spanning Paleozoic time." "Trilobites had many life styles; some moved over the sea-bed as predators, scavengers or filter feeders and some swam, feeding on plankton. Most life styles expected of modern marine arthropods are seen in trilobites, except for parasitism. Some trilobites (particularly the family Olenida) are even thought to have evolved a symbiotic relationship with sulfur-eating bacteria from which they derived food." Good reference with many pictures. "Rapid reversals of Earth’s magnetic field 550 million years ago destroyed a large part of the ozone layer and let in a flood of ultraviolet radiation, devastating the unusual creatures of the so-called Ediacaran Period and triggering an evolutionary flight from light that led to the Cambrian explosion of animal groups. That’s the conclusion of a new study, which proposes a connection between hyperactive field reversals and this crucial moment in the evolution of life. Geobiologist Joseph Kirschvink of the California Institute of Technology in Pasadena, is skeptical, however. Although the idea that UV radiation increases without Earth’s magnetic field is long-established, its effect on the evolution of life at this time should be limited, he says, as the radiation would not be able to reach and damage the germ line, the cells of the body used in sexual reproduction to pass genetic information to offspring. The radiation “would affect the outer skin … but the germ cells are usually internal and protected.” As such, he argues, the idea that increased levels of UV radiation significantly affected the evolution of life in the Ediacaran is problematic. "